While on holiday in Thailand, I searched for a metal gecko for the garden, which I thought would be perfect for the tropical theme I have been planning. However, when we asked our driver to take us to a nursery, although it was delightful, most of the ornaments there were made of concrete! There will be a blog specifically about this nursery on travelswithprincessandquiquinou. 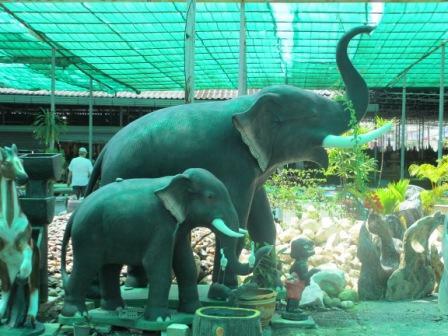 Imagine the excess baggage if I tucked these elephants into my suitcase, not that they would fit, as they were taller than a man, but you get my drift. It was still fun looking at all the variety, but nowhere in my travels did I find a gecko. Sometimes you have to travel all the way to a faraway place only to find that the item you wanted was readily available within a fifteen minute drive of your house. 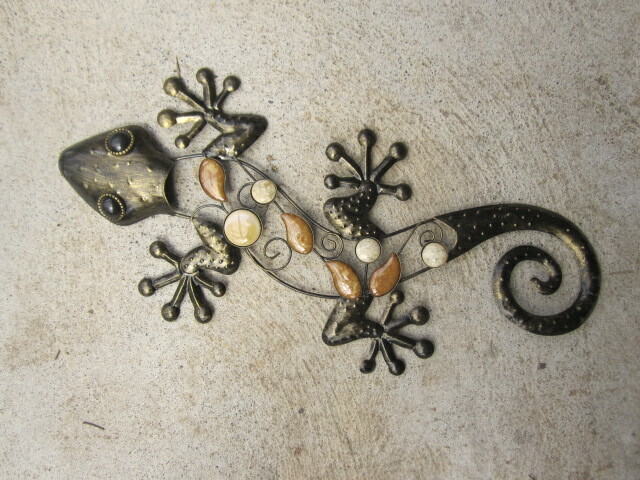 This lovely little metal gecko will quite probably go somewhere on the patio. It would have been nicer to say that we bought it overseas, which makes me a travel snob perhaps. At the end of the day if it is the right piece for the right place it really doesn’t matter where it was purchased! Up in the back yard next to the shed is an area I like to call Quirky Corner, containing some unusual items. When I was a primary school art teacher, I was demonstrating using clay, so I made a piece that looks rather like a caricature of my father. It’s funny, I love all sorts of weird and wonderful things, but garden gnomes are not on my list. 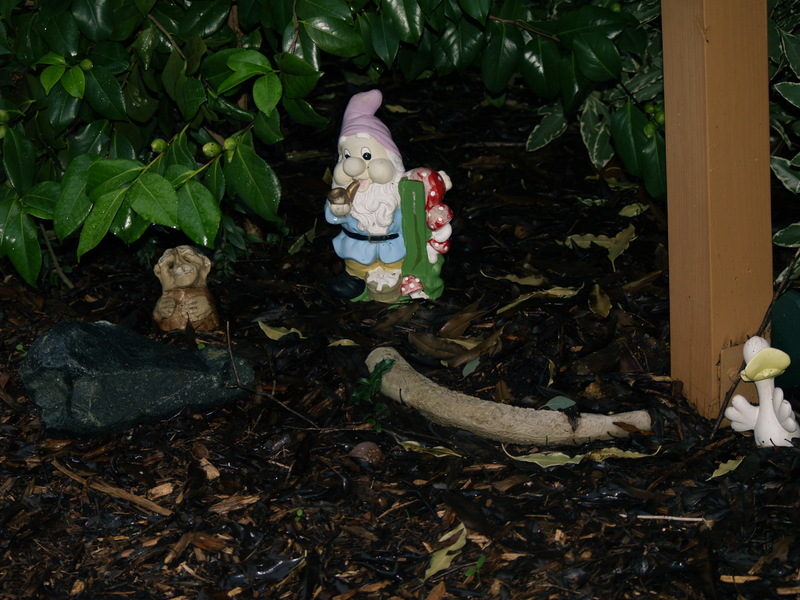 We have one honorary garden gnome only because my husband actually likes them. The souvenir tusk isn’t ivory, so no animals were harmed to have this sitting in our garden. To complete the current scenario there is a funny little duck. There will probably be future additions to Quirky Corner, but they must satisfy whatever criteria I am using at the time. Once again some of my garden features are on the move. 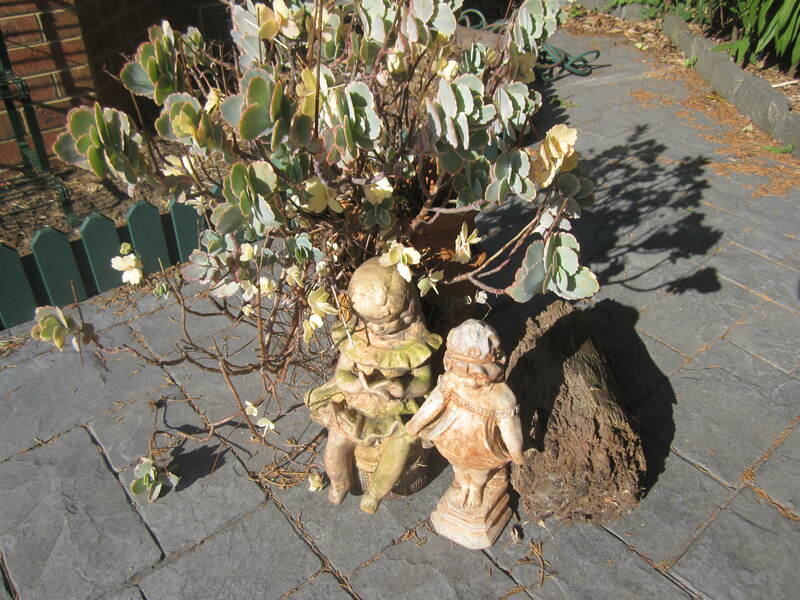 Jumping on the bandwagon with the large terracotta pot full of flowing succulents, are two cute young female ornaments.To help them look more similar I sponged the concrete ornament with some acrylic paint to mirror the colouring of the other one. It’s like my childhood days when you had to have a matching pair of swap cards! These girls have always reminded me of my two daughters when they were young. The young girl sitting reading a book was given to me by a dear friend and reminds me of our older daughter whose passion for reading was legendary. The second one, a small version of Curtsey Girl, is reminiscent of our younger daughter, who had adorable curls. We used to nickname them “Straight mate” and “Curly Girlie” for fun. Now they are in transit and ready for a new home. Stay tuned!